There are many pleasurable aspects of my "work". One is having the opportunity to salvage and clean up the old growth cedar logs so our natural wood fireplace mantels can be enjoyed by our customers. It has a long standing presence in the lives of the Salish/Native American cultures of the Pacific Northwest. It has been used in boat building, home construction, carvings (totem poles), etc. The old growth cedar is a celebrated wood and we are very tickled to be able to salvage some of it for our wood fireplace shelves, wood fireplace mantels, and the occassional table or bar top. 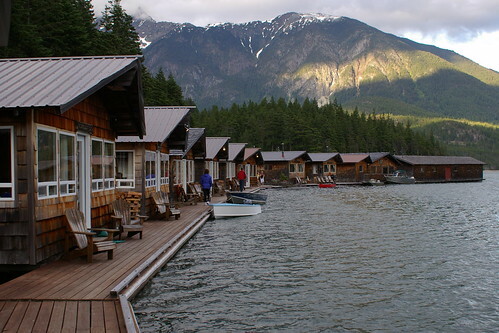 I am including a picture of our friends resort, Ross Lake Resort, in that it is not only a one of a kind resort, where hospitality abounds, but is a floating resort where old growth western red cedar logs are the mainstay for flotation.